Today morning, we informed you about the new Mi Power Bank 2i. As you might have read earlier, these power banks are manufactured in India and sold at affordable rates. The Mi Power Bank 2i was supposed to go on sale on November 23rd noon but we found out yesterday (21st November) that it was actually up for sale in the Mi Store Android app. 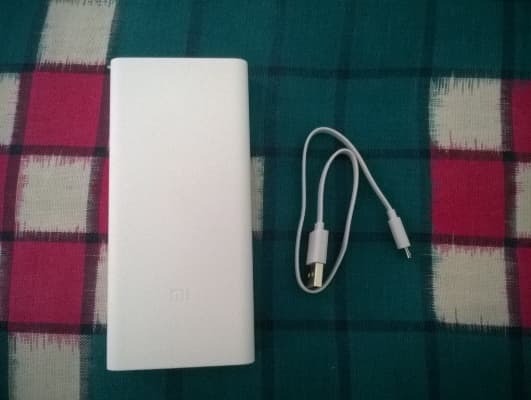 Once we found out that it was available for purchase we could not afford to miss a chance as Mi Power Banks just like every other Mi product tend to go out of stock within a few seconds of the flash sale. 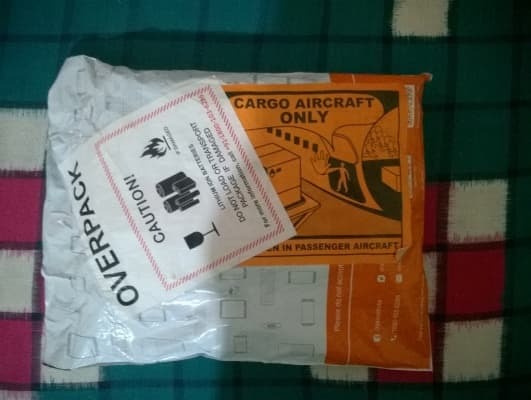 We purchased this one immediately and Xiaomi shipped it from Bengaluru and we got the delivery just a few minutes before in Bhubaneswar. So without further ado we have the first exclusive look and unboxing photos of the Mi Power Bank 2i. We will put up a review of the product once we have thoroughly tested it out. If you have read our piece on the Mi Power Bank 2i, you know that that it has a capacity of 20000mAh. 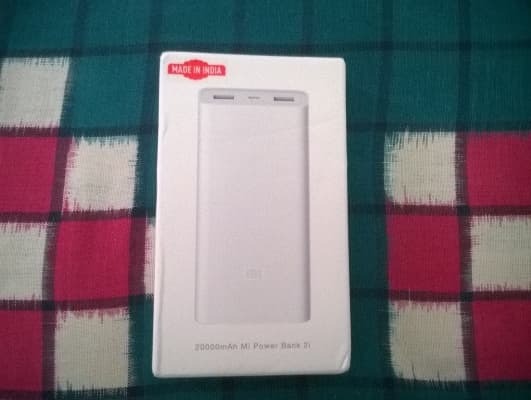 The Mi Power Bank 2i 20000mAh retails for Rs. 1,499 and it supports two way fast charging. Inside the unit we can find high density lithium polymer batteries and two USB output ports out of which one supports Quick Charge 3.0. 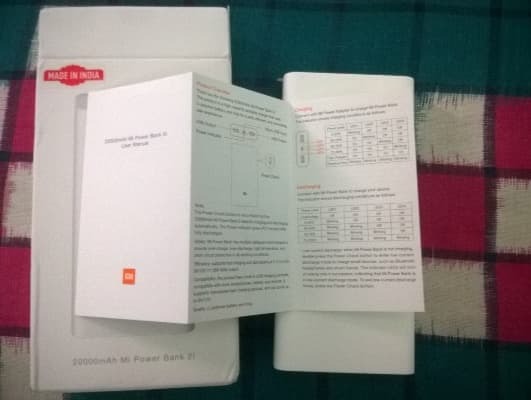 As we unbox the package we shall tell you more about the Mi Power Bank 2i. 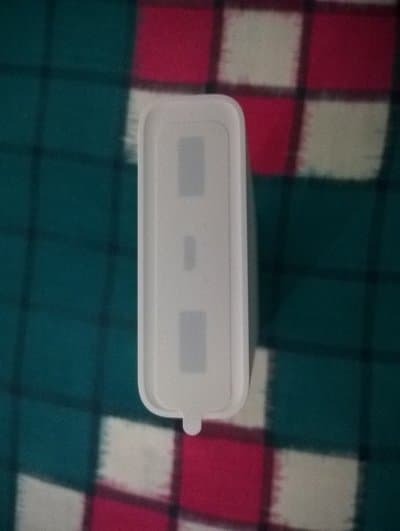 As you can see from below, the outer package has the Lithium-Ion battery warning logos which are applied for safety purposes when you buy any product that has rechargeable batteries in it such as smartphones, fitness bands anQuicd of course power banks. We are not showing the other side as it has out address and it would infringe on our privacy. 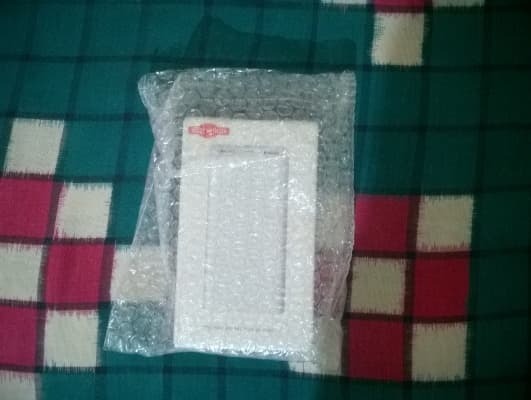 Once we opened the package, we found the Mi Power Bank 2i packed hurriedly in bubble wrap package. The package contains the product box and an “I Heart Mi” sticker. When we remove the bubble wrap we find the package which is white in colour and the red “Made in India” logo stands apart. Once we move to the back we have the features list, product details and manufacturing details. 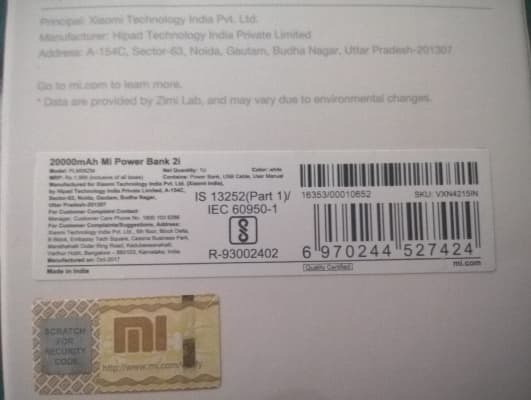 As we said earlier, the Mi Power Bank 2i is being manufactured in India ay the Hipad Technology center. We erroneously had mentioned the facility was in Gurugram in the last post. The facility is locaked in Noida, Uttar Pradesh. The date of manufacture states that the product was built in October in that unit. Below the manufacturer information we have a special Mi sticker with the hologram. Now this is quite special. 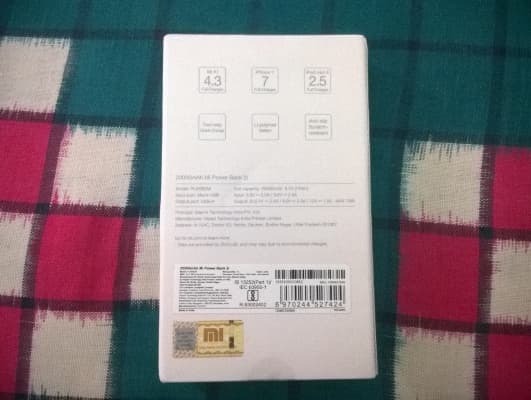 This logo has a scratchable box which contains the unique security code for the Mi Power Bank 2i. Now this has been done as a safety feature by Xiaomi so that people can avoid buying a counterfeit product. Once you scratch the area, you can see the 20 digit code which can be entered at this link to check authenticity of the product. Once we open the package, we find the Quick Start Guide/User Manual which gives the product overview, port details and precautions. The Mi Power Bank 2i is white, we mean really white and that put us in a bit of bother photographing it with a smartphone camera. As you can see from the image below the Mi logo is indistinguishable despite our best efforts. It has a patterned surface which isn’t too distinct to mar the looks of the product. On the top, the input microUSB port and the two output USB ports are sealed with a removable sticker. The package had another slot from which we retrieved a small microUSB to USB cable. This is clearly an ode to its biggest competitor in India, Ambrane who also includes a small cable with their packages. On the side you have the power button, which is used for various purposes. You can push it once to see the current power level and push it for a few seconds to enter the low power mode to charge small electronics such as Bluetooth headsets and fitness bands. You can also reset the device by using this button. That is it from us now. Let us know in the comments what you think about the Mi Power Bank 2i. We shall do an all round review soon. 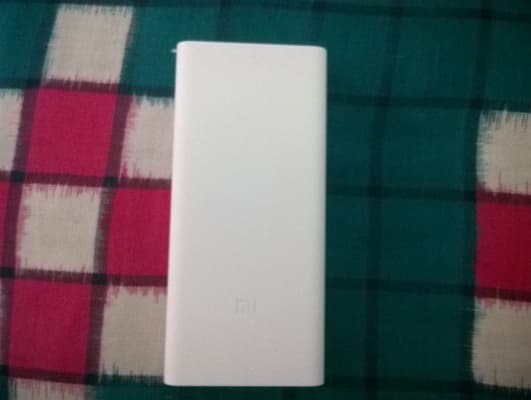 Now when I compared the specifications of the Mi Power bank 2i 20,000mah and my old Mi Power bank 2, 20,000mah on the Mi website, this is what I saw. Awesome writeup @Satya Swaroop Dash. 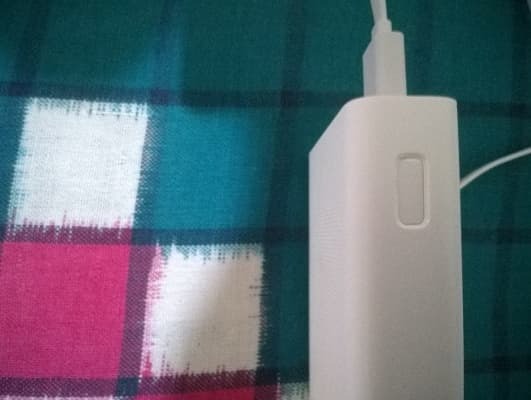 I don't have much experience with powerbanks; but Xiaomi does seem to do good job. Any other options worth considering?